With the Olympics 70 days away, ‘regeneration’ is a spectre that has been haunting east London residents for a number of years now. Unfortunately, most of the London and national media outlets have uncritically thrown their weight behind the Olympic craze, neglecting their duty of holding London politicians to account, and leaving it to countless independent local blogs, and sometimes the Guardian, to expose the social cleansing that is going on in London under the banner of ‘regeneration’. 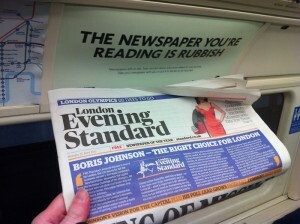 The media’s bias was most blatantly exemplified by the London Evening Standard in the run-up to the mayoral election, when it reduced the mayoral race to a personality contest, and backed Boris without a mention of his abysmal record on housing, policing and other factors that underpin London’s most serious social problems. In the Standard, West End theatre reviews feature on a daily basis, but no ink is being wasted to reveal the extent of Westminster’s housing bubble, or the rest of London’s housing crisis. On the Woodberry Down estate in Hackney, buildings have been neglected for decades and are earmarked for demolition. ‘Affordable’ housing will be replaced but there will also be 2,600 homes up for private sale – two-bedroom flats presently advertised start at Â£430,000. Most of the properties have been bought by Asian buy-to-let- investors. This means that most future residents on the estate will be renters, which will have a significant impact on the existing community. All tenants and leaseholders have been promised new accommodation on the estate, but many leaseholders and freeholders have refused a property swap because the flats offered are much smaller than their current homes. And most refuse to take equity in a new home, for much the same reasons, coupled with the fact that the value of their old home needs to be at least 70 per cent of their new one. Compensation money for the loss of their homes (based on ‘real market value’) is not enough to buy a similar property in Hackney, a heavily gentrified inner London borough which has seen house prices increase dramatically over the last ten years. And many leaseholders believe that Hackney Council has left their properties to rot in order to bring their value, and thereby the cost of loss compensation, down. Woodberry Down residents want their homes and facilities to be improved and their community to remain intact. 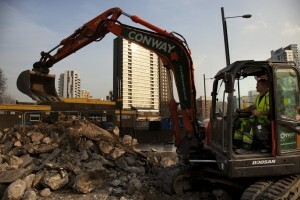 Further east, the Carpenters estate in Newham is also facing demolition, most likely to make way for a new UCL campus. For some background on the Carpenters estate, see this excellent blog post by a UCL student. The following film, entitled â€˜On The Edgeâ€™ tells the story of the Carpenters Estate in Newham, which is located next to the Olympic village. The film was made by Paul Stewart and other students from Goldsmiths University. TMP will be publishing more about both the Woodberry Down and Carpenter’s estate regeneration process over the next few weeks. Please ‘like’ Carpenters Against Regeneration Plan (CARP!) on Facebook.